GTWeb provides a fundamental component of the GTViewer family of products by allowing many users to access GIS data via the intranet or internet. GTWeb has had a variety of incarnations since its debut, but its goals have always remained the same. The methods to realize these goals, however, have changed to take advantage of the latest technologies. Distribution of your GIS data to a large number of users. While GTViewer and Pocket GTViewer can distribute your GIS data to a large number of users, the “Web” paradigm lends itself to distributing your data on an even larger scale at the price of lesser functionality and required network connectivity. Nevertheless, even with less functionality, many classes of users can easily take advantage of the information GTWeb can deliver to them and get even more value out of your GIS. Centralized management. By moving the management of the data being distributed to a single web server instead of each individual client, it becomes very simple to manage a large number of users because only the server needs to be updated with new information and configurations made to the web server will be inherently applied to all clients. User-friendliness and Usability. As with the rest of the GTViewer family, ease of use is paramount as the training and user adoption are critical to the success of a GIS solution especially when the solution is meant for a large number of users that may have little GIS experience. The first few versions of GTWeb (versions 1 through 4) relied on an ASP or ASP.NET application running on the web server and an ActiveX plug-in for Internet Explorer on the client. While this approach was very successful at getting GIS information to its clients, it suffered from two problems that limited its effectiveness. First, an ActiveX plug-in had to be installed on the client. While this task was a very simple requirement that needed no user interaction (other than running the setup), it was still a necessary step to accomplish before accessing your GIS data online. Second, utilizing an ActiveX control on the client bound the solution to Internet Explorer. When GTWeb was introduced, being bound to Internet Explorer was not a problem. Today, with Firefox and even Opera, the ActiveX control is not a good client solution and corporate standards may even preclude Internet Explorer from being used. With version 5 of GTWeb, many changes were made to both the server and client sides of the application. The GTWeb server was revamped to offer new features and the template website was upgraded to ASP.NET 2.0. The ActiveX client was still supported, but a new technique of distributing the maps to the client as raster images (.jpg files) was also supported. By using a standard raster file for the map, no ActiveX control is required on the client. The browser, by itself, is all the client needs, eliminating the two technologies problems GTWeb suffered from in previous versions. The non-ActiveX version of the GTWeb client offered a good user experience and supported an array of the functionality users of the ActiveX control version were used to: Zoom In, Zoom Out, Panning, and Attribute Info. The raster version (or non-ActiveX version) also supported background imagery (ECW files) which is not supported in the ActiveX client version. While the ActiveX control did have its drawbacks, it did have a few advantages not mentioned so far. First, it provided a very rich experience when viewing the GIS data. It was using the same vector graphics engine used by GTViewer which provided the same quality and feel desktop GTViewer users were accustomed to. This rich user experience provided by the ActiveX control made the raster version (non-ActiveX version) feel like a downgrade to some of the users already comfortable with the ActiveX client version. With version 7 of GTWeb (we skipped version 6 to stay in line with the rest of the GTViewer family version numbers), the non-ActiveX version has been enhanced to close the gap between the rich user experience provided by the ActiveX control version. While the GTWeb server continues to support the ActiveX client, the new template web application is focuses solely on the non-ActiveX approach and utilizes Ajax, client-side Java script, and ASP.NET 2.0 to give the client a much richer experience than the previous version. The new template web site provided with GTWeb 7.0 is still very similar in functionality to the previous version, but it now has more of a “Web 2.0” look and feel. Smooth panning (drag the map view with the mouse). Mouse wheel zoom-in and zoom-out. Upgraded query form and query reports. Display Preset selection (as defined in the data’s .GTM file). Project Group support (for running multiple sets of projects on the same server). Extract File (.gtx) creation and download. With GTWeb 7.0, you still have centralized management of the web projects, there is no client software to load, and it supports the top 3 browsers (IE, Firefox, and Opera). GTWeb is still ideal for both internet and intranet GIS applications. GTWeb can be used to augment your GTViewer and/or Pocket GTViewer seat and can provide universal access via the internet and web browser. Version 7.0.x.6 of GTViewer is available. - NEW - GT/Field now logs an error message when an edit feature is not found in the Edit_Features.txt file. - FIX - GT/Field was not accepting a GPS_POINT type when the type entry had more information than the type name. It should have ignored the extra info. - FIX - GT/Field was sometimes corrupting previous value when moving between them. - FIX - GT/Field was reformating Read Only value incorrectly in some cases. SECO (Sumter Electric Cooperative) holds an annual meeting each year to provide an opportunity for the members to see what’s new at the Cooperative and to interact with employees. It also gives SECO employees a chance to meet with the members, brag about their latest technical innovations, and address any member needs. This year was the 69th Annual Meeting, and several thousand people showed up for talks, barbeque, and exhibits. 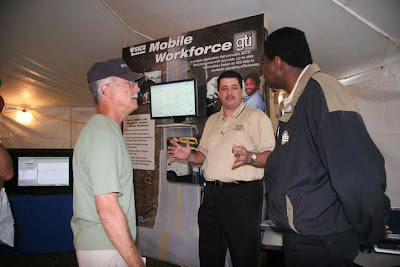 One such exhibit (pictured above) proudly shows the GTI logo. The exhibit has a running copy of GTViewer and explains how SECO is using the investment in mobile mapping technology to operate more efficiently and reduce costs for members. GTI will be in booth #232 at the AGA Operations Conference & Biennial Exhibition in Dallas, Texas, April 24-26. Come by the booth and visit with us if you are at the show. Pocket GTViewer version 7.0.x.4 is now available. - CHG - Evaluation Version Updated. - FIX - The intBea_Frequency property was not being propertly stored in the TrimbleSettings.ini file. Version 7.0.x.5 of GTViewer is available. - NEW - Modifications to the Dgn Export to allow standard symbol font characters to be mapped to TrueType fonts characters. This addition allows G/Techology data or other data using TrueType fonts to be exported to a .dgn. - NEW - A new section has been added to the status bar to indicate if the GPS is running and to indicate if it is tracking.